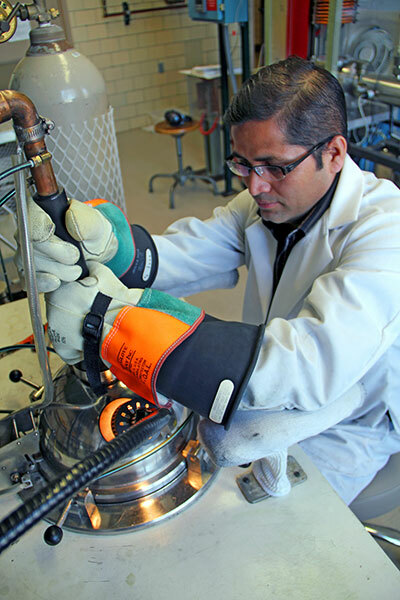 Scientists at the U.S. Department of Energy’s Ames Laboratory have created a new magnetic alloy that is an alternative to traditional rare-earth permanent magnets. The new alloy — a potential lower-cost replacement for high-performance permanent magnets found in automobile engines and wind turbines — eliminates the use of one of the scarcest and costliest rare earth elements, dysprosium, and instead uses cerium, the most abundant rare earth. The result, an alloy of neodymium, iron and boron co-doped with cerium and cobalt, is a less expensive material with properties that are competitive with traditional sintered magnets containing dysprosium. The research was supported by the U.S. Department of Energy’s ARPA-E REACT program (Advanced Research Projects Agency-Energy–Rare Earth Alternatives in Critical Technologies) which develops cost-effective alternatives to rare earths, the naturally occurring minerals with unique magnetic properties that are used in electric vehicle (EV) motors, and wind generators. Replacement of Dy and substitution of Nd in NdFeB-based permanent magnets by Ce, the most abundant and lowest cost rare earth element, is important because Dy and Nd are costly and critical rare earth elements. The Ce, Co co-doped alloys have excellent high-temperature magnetic properties with an intrinsic coercivity being the highest known for T ≥ 453 K.